The Deepwater Horizon oil-spill is an unquestionable tragedy, but if there is any defining message to be drawn from it, it is that the age of cheap, easy oil is over and we may now contemplate the dawn of hard oil. The Deepwater Horizon oil spill is thought to be pouring anywhere between 5,000 and 100,000 barrels of oil into the Gulf of Mexico each day, according to different estimates. The blame is being laid squarely on the shoulders of B.P., under whose auspices the deep-sea drilling operation is being conducted. An oil-well blowout occurred on April 20th, resulting in a catastrophic explosion that wrecked the oil-rig, killing 11 men. 17 others were injured, while another 98 passed relatively unscathed, at least physically. It has been speculated that the explosion was triggered by inadvertent drilling into methane hydrate, although it is debatable that the temperature of the rock being drilled would be low enough for the material to exist there. Methane hydrate can, however, exist close to the seabed in the near-mile depths of water, a fact that scuppered an initial attempt to place a 120 tonne dome over the oil to collect the oil, since methane hydrate crystals blocked the steel canopy at the top of the dome. B.P. made an unsuccessful attempt to stem the flow of oil from the well using a "top-kill" technique. A mixture of heavy drilling fluid ("mud"), and detritus including bits of rope, shredded tyres, metal pieces, golf balls and so on ("junk-shot"), was pumped under a pressure of 6,800 psi into the well in the hope that this would hold-back the oil long enough that the outflow could be sealed with cement, but the ensuing pressure of oil and gas from the well exceeded even this, and the oil is still pouring out. As usual, there are considerable environmental burdens which B.P. has promised to fully cover the costs of, which are estimated at $8 billion. They may indeed prove far higher and there is speculation from Russian analysts that the overall unfolding calamity might bankrupt the company. 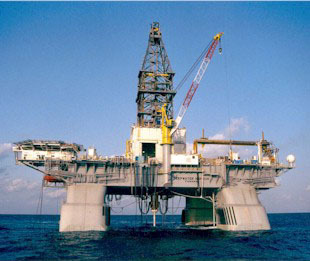 While other attempts are planned to block the hole, it is probable that oil will continue to pour from it for another couple of months, until relief wells are drilled to intersect and reduce the pressure in the currently flowing well and cut-off the leakage of perhaps 50 million barrels of oil contained there by the injection of concrete deep into the sea-bed. The relief wells require drilling to depths of perhaps 2 -3 miles, hence the seemingly long schedule for their expected completion. What is clear is that much useful information is being gleaned about how to deal with a disaster of this kind, which can be expected to happen again, and other kinds of spills, as the prospect of deep-water drilling for oil is realised. While B.P. are taking a lot of flak for the incident, they are employing the best of the few engineers worldwide who have the knowledge to deal with it. There are naive calls that there should be no more such exploration and that surely alternatives can be accessed, but this misses the underlying truth that much of the conventional easily-got onshore oil has already been pulled from the earth. If the oil-based civilization of humanity is to continue (accepting the natural limits imposed by peak oil) and not be brought to an abrupt and anarchic halt, bearing in mind that not only does oil account for 40% of the entire world energy budget but is the only serious liquid-fuel for all global transportation, and the raw feedstock for all manufacture including food production, it will be necessary to derive oil from a number of different and inhospitable sources including the deep-sea. There are many sources of unconventional oil but which provide it much more slowly than do the conventional fields we are used to. In the case of heavy oils (e.g. from Venezuela) more intensive processing is required to refine them, thus reducing the production EROEI. The simple truth is that future provision of oil and natural gas will be an extraordinarily complicated and expensive business, which tests and inaugurates the limits of technology. There are still cheerful media pieces being written that blithely attempt to reassure us that there is plenty of oil left, but which ignore these aspects, and also the better than odds-on chance that there will be plenty more damage to vulnerable ecosystems as lie in the wake of the Deepwater Horizon oil, in the future. So far, the environmental impact of this incident is far less than e.g. an oil-tanker running aground (the Exxon Valdez, say), since the spill is 50 miles offshore, and the oil is being largely dissipated in the water column before it reaches the surface. So far it ranks as the only 40th worst oil-spill disaster, but it might ascend the league-tables depending on how long it takes to truncate the flow. Unquestionably, this is a tragedy, but if there is any defining message to be drawn from it, it is that the age of cheap, easy oil is over and we may now contemplate the dawn of hard oil.